would be able to avoid any obstacles in the way. I am not with you all for quite some time since halting my Wall-e hacking project. I cant continue the project cause my girl wont allowed me to do such a criminal thing on her Wall-e.She love it so much. Now I am back with another hacking. As the title. Yes this time its Isobot. I dont have intention to do any hack on this little guy at all when I first got him. But after about three weeks the main board is faulty.I am not sure the cause but maybe because by overload current from a faulty servo or maybe I stress him so much. Simple really - I have a standard Robopet which I have recently rediscovered and which I want to try to get to bond with my cat! However, I think the scary / loud Robo-noises may be too much for this and so was wondering if anyone knows of a quick and easy (and non-fatal) way of switching off the Robopet sounds? I was staying up latelast night making some new mods to old mods the i found myV1 that i did a light hack on and i did some thing new. Hi I'm new to this forum and I say hello. I was wondering if anybody can tell me where to find an I-Cybie robot battery wiring diagram and I mean the diagram of the interior of the battery. I don't know how the wires are to be connected inside because these batteries are not the simple red/black positive/negative type, they have a third wire that connect to one of the cells. I'm not sure but I heard that the other wire supplies a different voltage to some batteries from the charger. Read more about Need I-Cybie battery diagram. For those folks not familiar with the Spykee bot by Erector/Meccano, it's basically a mobile webcam that you can drive around a room using an application on a remote PC. One of the missing features of the Spykee is the ability to remotely adjust the view of the camera. If you point the camera so it can see around the room, then it cannot see it's treads to know if it's rolling over something. Some folks have added microcontrolled servos, tied to some toggleable LEDs, to provide remote tilt of the camera. I took my roboquad apart so I could have a look where all the connectors go on the main board. I then reassembled it and started my painting in bits and pieces. I've started painting around the top of the head and the back upper section of his body. The dark grey swirly areas are gold while the whte body will become black. The painting isn't a problem so far....However when I reassembed him I noticed a small problem. Just a little cosmetic mod I put together this week. 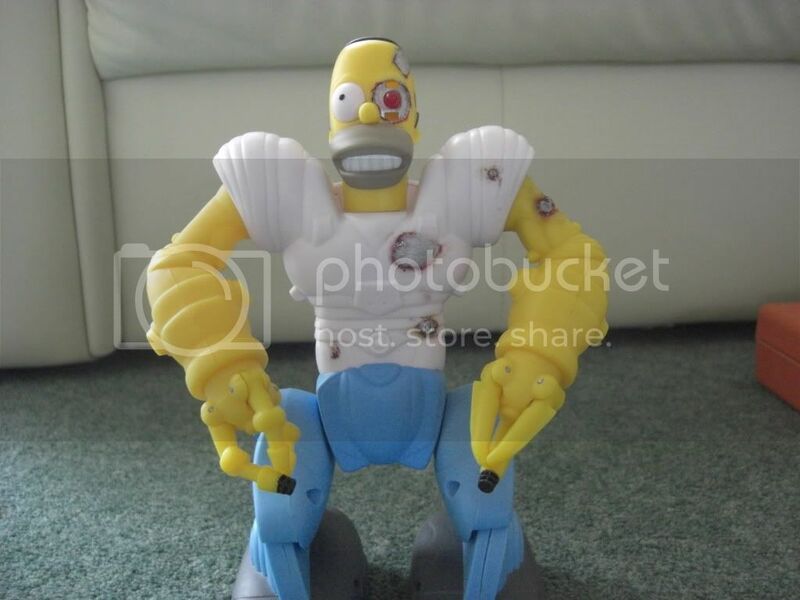 I've got two Mini Homers, and got bored of having them identical, so seeing as I'm a huge Terminator fan and I'm gearing up to the new movie, I thought I'd make Homer a little more Skynet-esque. Hope you all like it as it took quite a while. I've got a load more photos available if anyone wants to see.